There's more than a little biographical irony in this solidly crafted western. The action is set in 1925, around the time that a young hopeful named Joel McCrea was working as a movie stuntman and horse wrangler. 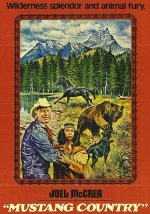 Here, 51 years on, McCrea is making his final appearance in a distinguished screen career, playing a retired rodeo star and rancher who helps a native American lad track down and tame a wild horse in time for a big meet. Written, produced and directed by John Champion, Mustang Country is little more than a nature film with some homespun drama thrown in but it makes a nice family dvd.